This railway was the shortest branch line with a regular passenger train service in East Anglia. It was conceived by local gentry, landowners and businessmen to improve transportation of their produce to London and the provincial markets. The line preserved its independent status for 33 years before being absorbed into the Great Eastern Railway. The Suffolk market town of Eye was at one time among the most affluent boroughs in the country and before 1822 returned two members of parliament to the House of Commons. The area suffered from the agricultural depression, which was only just showing signs of recovery with the advent of the first railways in the country. Eye suffered the ignominy of initially being omitted from the railway map. When the Ipswich-Norwich line opened in 1849, the route by-passed the town three miles to the west at Mellis. Townsfolk supported plans for a railway to Mellis and the GER promised to work the line if it was financed and built independently. In 1867 the line was opened to traffic. For the first decade the GER worked the line for 50 percent of the gross receipts, then demanded a further 10 percent, leaving just 40 percent for the local company. Despite this setback fortunes improved with increasing traffic and small dividends were registered from 1883. Relationships between the two companies then improved and during the last eight years of independence dividends of 5 to 5� percent were recorded. Such was the standing of the local company that on takeover the GER exchanged shares at par, and in the halcyon days before the First World War receipts continued to increase. As roads and motor vehicles improved so passenger traffic declined. 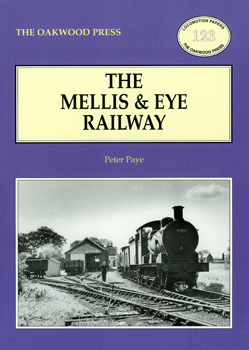 The lack of good main line rail connections at Mellis, in favour of nearby Diss, added to the problems and in the depressed days of February 1931 the passenger service was withdrawn. Freight traffic continued to show healthy returns up to and during the Second World War but the declined so that the one train running daily, Monday to Friday, was withdrawn in July 1964. Passengers on the London to Norwich line now travel through Mellis at speed, oblivious to the fact that it once served as the junction for a fascinating branch line which faithfully served the locality and just failed to reach its centenary. A5 format, 112 pages , 80 illustrations.